A decade-long legislative effort to return the Delta Queen Steamboat to America’s waterways is complete. On Tuesday, President Donald Trump signed a law renewing the vessel’s exemption from the 1966 Safety at Sea Act, allowing her long-awaited return to the nation’s rivers. “Today marks the beginning of a new chapter in American steamboat history,” said Leah Ann Ingram, vice president and chief operating officer of the Delta Queen Steamboat Company. The vessel is currently docked in Houma, La., where major repairs will soon be underway. One of the most significant upgrades will be replacing the boilers, which are original to the boat and were manufactured in 1919. The generators, steam line, heating and air, plumbing and galley will also be replaced. Common areas and staterooms will see various cosmetic updates. In all, the Delta Queen Steamboat Company estimates the repairs will cost between $10 million and $12 million. When renovations are complete, likely in 2020, themed voyages will resume along the Mississippi, Ohio, Tennessee, Cumberland, Kanawha, Arkansas and Illinois Rivers. The Delta Queen will travel the same routes as she did before her hiatus, with a few additions. The boat will offer 3-night, 5-night and 7-night cruises. “We look forward to once again sharing her rich history with our passengers and history enthusiasts throughout America’s Heartland and Deep South,” said Mr. Martin. 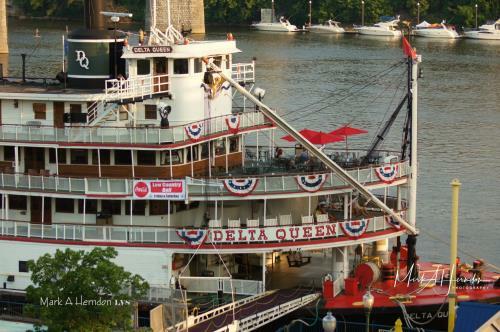 In 2008, the Delta Queen was forced to retire from overnight cruise service when her Congressional Exemption from the 1966 Safety at Sea act expired. The law was intended to prohibit ocean-bound vessels from carrying overnight passengers unless completely made of non-combustible materials. Congress approved nine exemptions over four decades to allow the Delta Queen to continue operations until 2008. The President’s action on Tuesday will allow the Delta Queen to remain in overnight cruise service through 2028. “We must pause to thank President Trump and the legislators who worked together to grant the Delta Queen permission to cruise again. Without Ohio Congressman Steve Chabot and Missouri Senators Claire McCaskill and Roy Blunt, this significant piece of history may have been lost,” said Ms. Ingram. The Delta Queen is a National Historic Landmark and on the National Register of Historic Places. The steamboat is also included in the National Maritime Hall of Fame and was named a National Treasure by the National Trust for Historic Preservation.